Designed to fit snugly WE Europe EU / G-Series Airsoft Glock and can be attached to the users belt. The holster is designed to allow the user to quickly and effectively draw their pistol during combat at maximum speed, whilst still remaining safe. The holster retains the Airsoft Pistol securely and is held in place by the push button release system and covers the trigger to reduce the risk of a Negligent Discharge. The holster is constructed from lightweight, yet durable, Polymer and attaches to the operators belt using a tight gripping paddle system. The angle of the holster can be adjusted to be at any angle allowing you to adjust the pistol to your optimal drawing position. 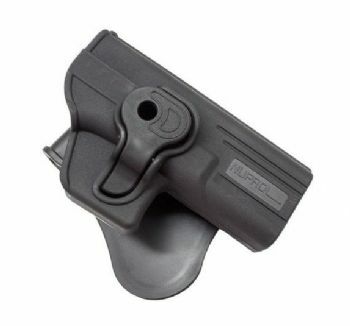 The holster can also be removed from the paddle system and attached to WE Europe's NUPROL Drop Leg Holster Platform, giving you more options and more possibilities. This is the perfect holster for those who want a holster which allows for quick drawing, whilst at the same time, keeping your Airsoft Pistol secure and safe.